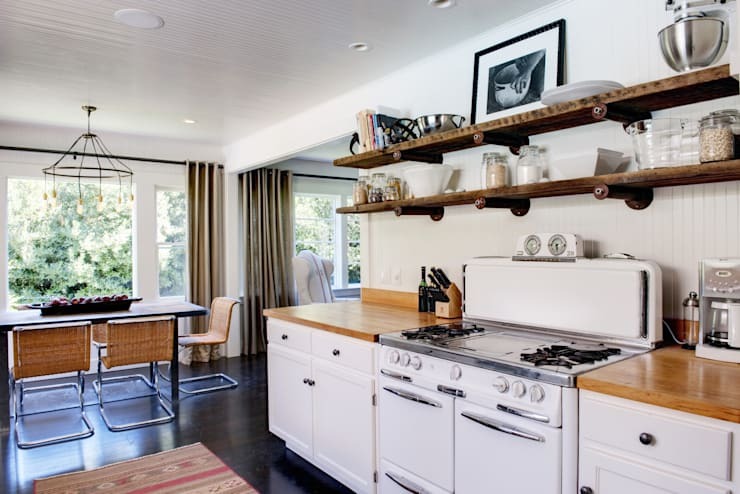 Open kitchen shelving is a really easy option for those who love a more casual kitchen design. They provide easy access and there's no fussing around with opening and closing doors all the time. 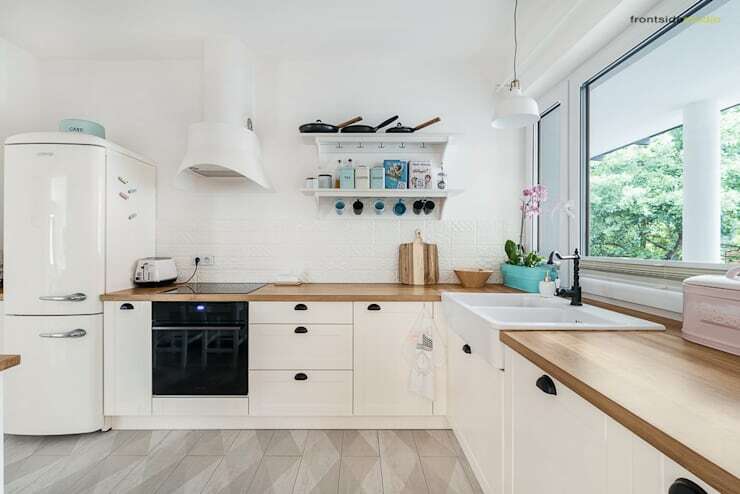 In visual terms, the biggest benefit is that kitchen shelves will make a small kitchen feel more airy and free. They might even give you the opportunity to display your favourite ceramics and introduce a much-needed splash of colour. So what are the options available? 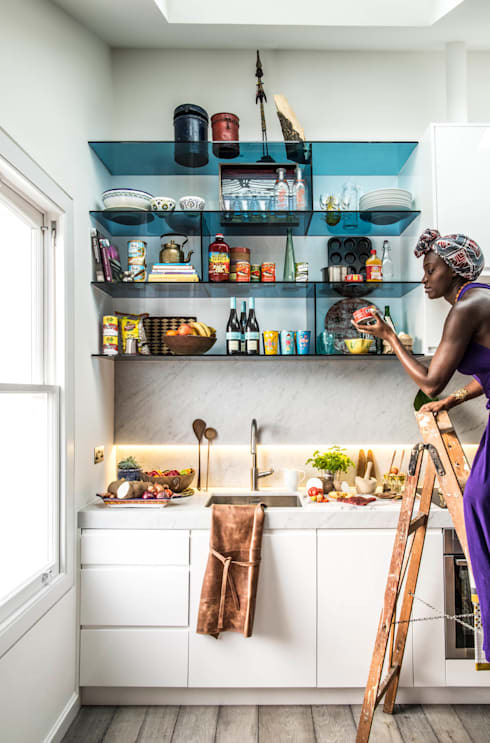 Well, today we present 8 kitchen shelving ideas to copy at home. There's something here for everyone! 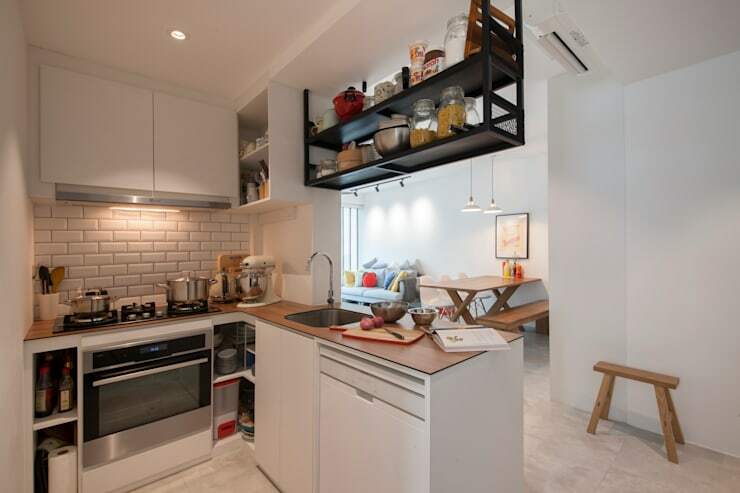 These suspended kitchen shelves add a real lift to this small Hong Kong apartment. This is also a really innovative way to counteract the potential visual weight of using black in a small space. For something like this, it would we well worth using a professional kitchen planner. Wooden shelves are always a lovely touch. There's no noise when stacking items and they give the kitchen a real sense of cosy homeliness. 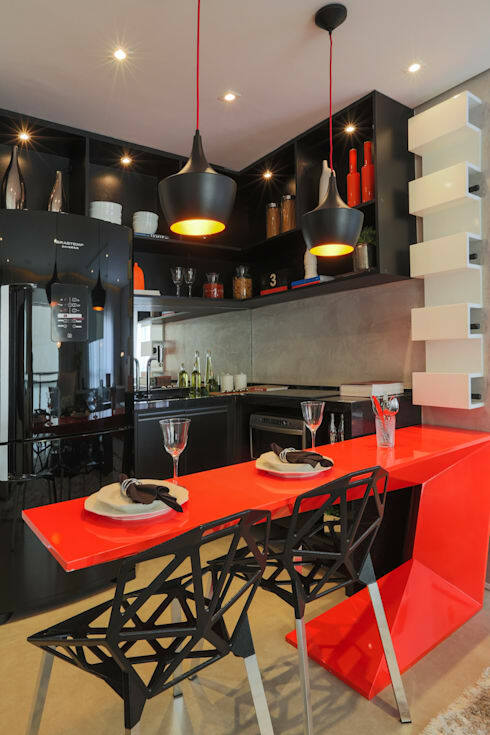 These black open kitchen shelves have been used to create a really dynamic impact. The black background provides the perfect spark for a riot of colour. We love the recessed lighting behind these open kitchen shelves. 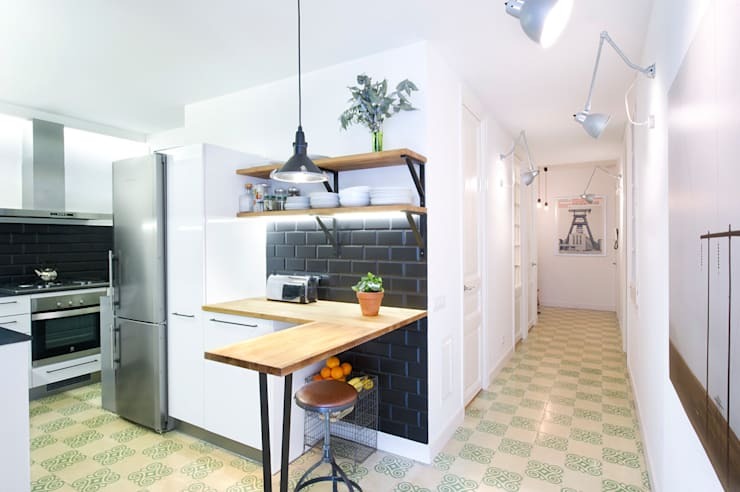 They really highlight the splashback and give this country style kitchen a real lift. 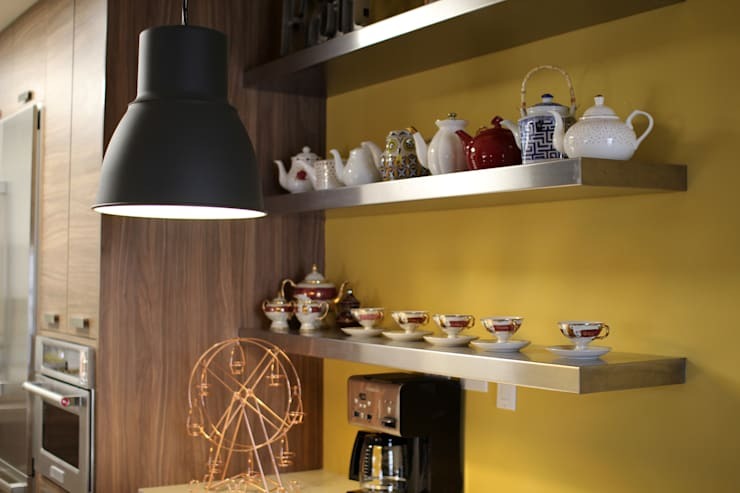 Shelf supports are always a prime consideration when designing your kitchen shelving. Check out these unique shelf brackets. 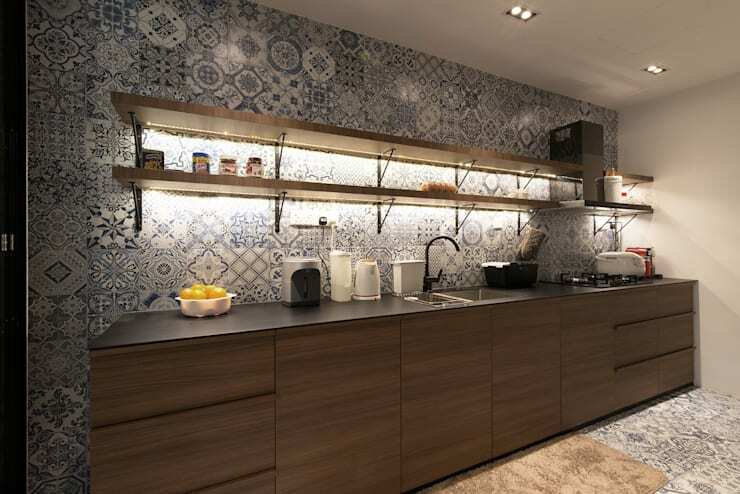 The lines of the shelves remain interrupted and they add a very rustic style flavour to this kitchen. Metallic shelves are perennially popular because they are easy to clean. This is why they are the material of choice in industrial style kitchens! For a super slick approach, try floating chrome shelves like this! These perspex blue kitchen shelves are to die for. The fine width and semi-transparent material also gives this little kitchen a very refined and contemporary quality. If you like a classic country style kitchen, you'll love these kitchen shelves. They are perfectly contained and have little hanging hooks as well! For more home inspiration, check out A creative apartment to inspire you. Do you prefer open kitchen shelves over closed cabinets?